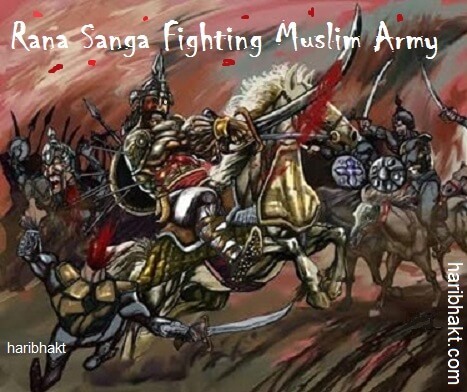 Maharana Sangram Singh or Rana Sanga was the last ruler of medieval India who stood up against the muslim invaders and was able to unite many Hindu states to fight against the islamic foreigners. He was a Rajput in a true sense, a valiant fighter and a king who is legendary for his chivalry and generosity. He lost the battle to Babur due to deceit and betrayal but his gallantry inspired many future kings of India that waged war against muslim invaders and did not let the terrorists capture entire India ever. Rana Sanga succeeded Rana Kumbha as the king of the Mewar. He defended his kingdom bravely from repeated invasions of muslim conquerors of Delhi, Gujarat and Malwa. He was the most powerful of the Hindu kings of that time. During his rule, Mewar touched the pinnacle of prosperity and as an exemplary king he protected and developed his empire. Rana Sanga had over 80 wounds all over his body and joints, was blinded in one eye by his brother, lost an arm by a sword cut against the Pashtuns of Delhi, and he limped because of an arrow wound in his leg which never recovered. Another incident is important to highlight which shows his modesty and humanitarian nature. However Hindu king repeatedly made the same blunder by mixing bravery with munificence. His chivalry was reflected when he treated terrorist Mahmud of Mandu with generosity and restored his kingdom even when he was defeated and taken as a prisoner by Rana in spite of being hurt in the fight with muslim army in the same battle. Mahmud practiced Al-taqiyya* of getting down to the knees of great Hindu king Rana Sanga and asking for mercy. 1 Maharana Sangram Singh, Rana Sanga’s Vision of Building Hindu Rashtra was Defeated by his own Men! 1.3 Betrayal of a Coward and a Greedy Hindu! 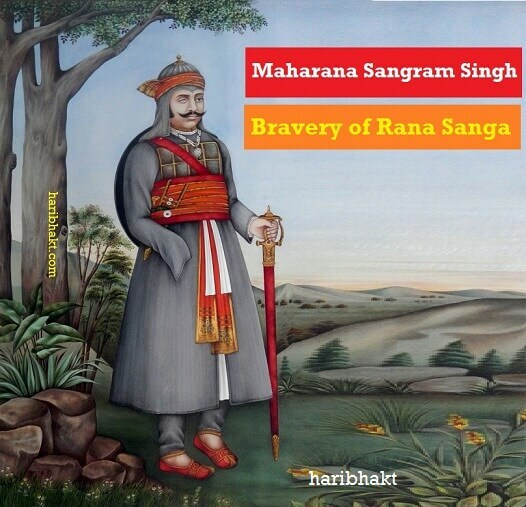 Maharana Sangram Singh, Rana Sanga’s Vision of Building Hindu Rashtra was Defeated by his own Men! After his initial success in battles against muslims, Rana Sanga became recognized within north India as a principal player in the fight against invaders to rule the northern territories of princely India. His objectives grew in scope – he planned to regain the much sought after prize of the muslim invasion of the time, Delhi, and bring the whole of India under his control to re-establish Hindu Rashtra. He got Gujarat and re-captured Malwa and was now close to Agra. He kept his ears and eyes open to the happenings of mughal terrorists, after battle of Malwa, he heard that Babur had defeated and slained Ibrahim Lodi to be a master of the Delhi territory. Being fearless and strong Hindu ruler, Rana Sanga decided and plot a plan to defeat terrorist Babur. As a first move, he coerced Afghan fugitive princes like Mehmud Lodi to join him. A number of Mewati Muslims under Hasan Khan Mewati also assured their support to Rana Sanga. Then Rana ordered Babur to leave India. Initially he hoped to attain this by sending his vassal Sardar Silhadi of Raisen as his emissary. Silhadi went to give this strong message to Babur. After hearing this latter devised a different plan and used a cunning trick of money, women and sharing of power to convince Silhadi to his side. Raja Shiladitya (Sildhadi) finally was won over by Babur using deceitful means. Babur knew about bravery of Rana Sanga, he had no choice but to fight with the ferocious Hindu king. He admitted to the messenger that to rule North India he may have to engage in battle with Rana Sanga and hence had no desire for retreat. Betrayal of a Coward and a Greedy Hindu! Sildhadi had a history of bootlicking muslim invaders. The title was given by terrorist muslims for his betrayal towards Hindus, was about to gain everlasting notoriety among natives, so much that after generations no one named his son as Shiladitya. Babur and Silhadi hatched a plot. Silhadi, who held a large contingent of 30,000 men would join Babur’s camp at the critical moment of battle and thus defeat Rana Sanga. Silhadi who went back to Chittor, told Rana that war is a must and bluffed Hindu king that Babur has a weak, under-prepared and tired army, it is right time to attack him. The Rajput forces of Rana Sanga, supplemented by the contingents of Mewati and the Afghan, Mehmud Lodi and Medini Rai of Alwar, met Babur’s army at Khanwa near Fatehpur Sikri in 1527. The battle, which lasted for not more than 10 hours, was bitterly contested and became an exceedingly brutal affair. 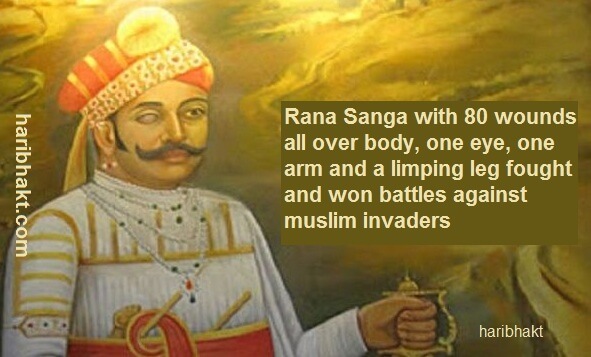 Rana Sanga is one of the few Hindu rulers who despite losing one arm, one eye and numerous other grave injuries carried on with great valor to fight against muslim army in different battles without showing any signs of inability. At a critical moment of the battle with Babur, the defection of Silhadi and his contingent caused a split in the Rajput forces. After all he was a human-being of flesh and blood, Rana Sanga was trying to rebuild his front, profusely bleeding fell unconscious from his horse due to heavy loss of blood. Shiladitya’s cavalry spread rumors that the Hindu king is dead and no one is leading the fight from their side. The Rajput army thought their leader was dead and bewildered in disarray, thus allowing the terrorist mughals to win the day. Rana Sanga was whisked away to safety by the Rathore contingent from Marwar and once he became conscious he learnt about the defeat. But Rana Sanga, unwilling to admit defeat, set out once more to rebuild his military and renew war with Babur. On 30 January 1528, Rana Sanga died in Chittor, apparently poisoned by his own chiefs who held his plans of renewing the fight with Babur to be suicidal. Big Lesson for Hindus – Identify traitors among us, do not encourage traitors and their treacherous activities that cause harm to the nation and Hindu unity. Encourage and support fighters among us. A person who was half his body strength and ability fought for the pride of Hindu unity and Rashtra. Making up his physical loss with his bravery and fearlessness. 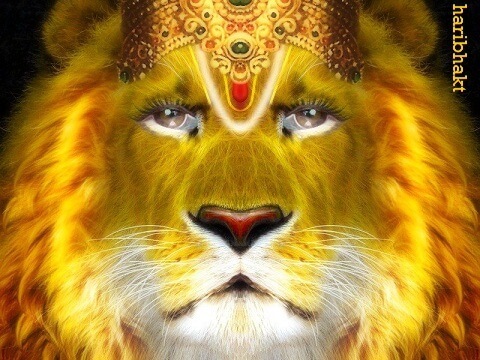 It is time we learn from the history and make ourselves Hindu Lions!